Biologic therapies pose a risk for opportunistic infections, especially for reactivating latent tuberculosis infection (LTBI). 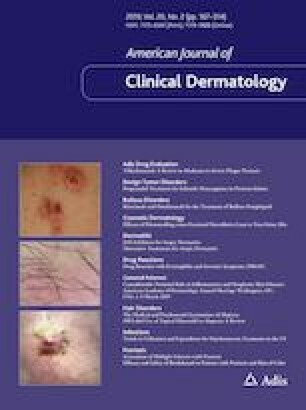 The aim was to describe the clinical features and mortality rate of active Mycobacterium tuberculosis (TB) in psoriasis patients receiving biologic therapies. A systematic review of PubMed, Google Scholar, ScienceDirect, Cochrane Library, and ClinicalTrials.gov databases was performed. Studies describing active TB in patients with psoriasis receiving biologic therapy from inception to May 31, 2018 were included. Clinical data as well as mortality rates were recorded. Fifty-one studies were included, evaluating 78 patients with active TB: 11 prospective studies, 13 retrospective, and 27 case reports/series. Most patients (73%) with active TB were male, the mean age was 48 ± 13 years, and 85% were of European or Asian origin. Pre-treatment LTBI screening was negative for 63% of patients. Disease presented in 33% of patients within the first 3 months of treatment, and in 51% within the first 6 months. Most patients (72%) presented with extra-pulmonary TB, and 49% had disseminated disease. The mortality rate was 7%. Limitations of this review are its small sample size and inclusion of case reports. Some patients develop active TB despite LTBI screening. Clinicians initiating biologic therapy in patients with psoriasis should be aware of the clinical features of active TB in this scenario. The online version of this article ( https://doi.org/10.1007/s40257-019-00432-y) contains supplementary material, which is available to authorized users. We would like to acknowledge the help of Dr. Debby Mir in writing the manuscript. The data have not been previously presented. IS, EB, ESC, TA, DS, EH and LP report no conflict of interest. WHO estimates of tuberculosis incidence by country 2014 v2.pdf [Internet]. [cited 2019 Jan 30]. https://assets.publishing.service.gov.uk/government/uploads/system/uploads/attachment_data/file/491527/WHO_estimates_of_tuberculosis_incidence_by_country__2014_v2.pdf.